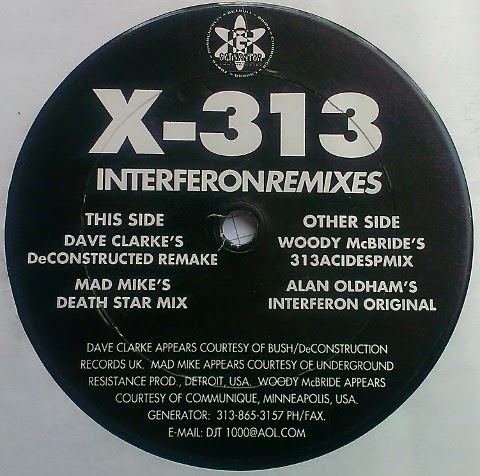 From 1995, an intense blast on Alan Oldham’s Generator Records (Detroit): “Interferon”, grinding proto-rave monster and the label’s iconic track, was remixed by several influential faces of the mid-1990s scene. It jump starts with Dave Clarke’s in-your-face deconstruction, squeezed between the original’s evil riff and angry breakbeats with loud ‘X-313!’ shouts of thundering kick drums. Interstellar warrior Mad Mike takes shamanically grooving “Death Star Mix” to the toxic area first intercepted by the UR’s catalogue number 022. On the other side, the 303 don Woody McBride prefers to have it funky with a stifled bass line slightly touching Death Star textures, before the original wraps up the EP. Impressive.